My friends and I are going to see Katy Perry this summer!! We're flying to Montreal to see her on July 2nd. I will be sporting Teenage Dream for sure!! 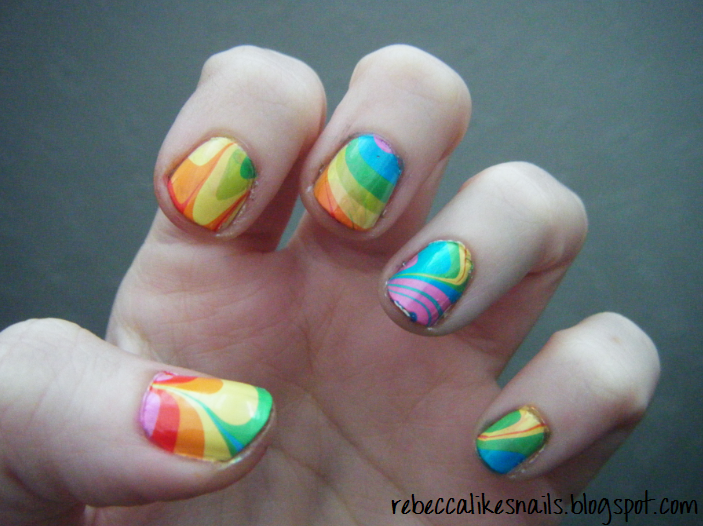 When I think of Katy Perry I think of bright colors and fun things, so here are some super bright rainbow water marble nails! Water marbling is not that easy. I'm never really a huge fan of the finished look, but I liked these. I hadn't cleaned up this hand before I took the picture. The pinky on this hand is adorable! If I could get all my nails to look like that it would be awesome. I used all Sally Hansen Xtreme Wear polishes in this marble. Water marbling: frustrating, but sometimes cute. this is definitely cute =) now I want to make one based on your background image! i thought the same thing when i posted this!! How do you do this! 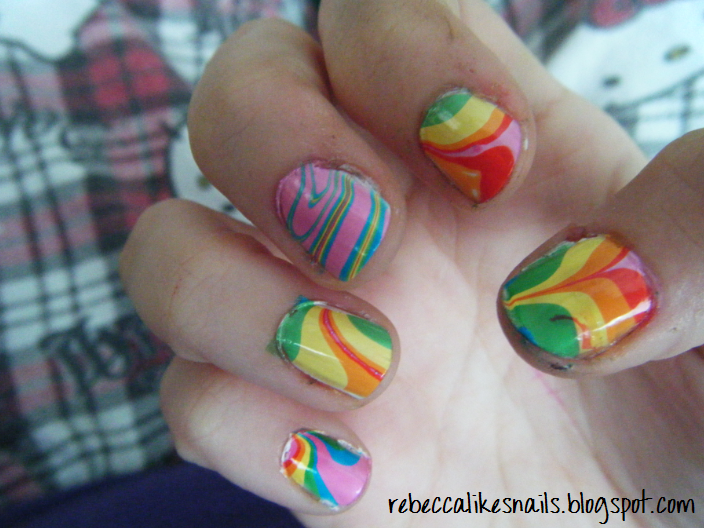 This is by far THE MOST AWESOME water marble I've *ever* seen!! Do you find that Sally Hansen Xtreme Wear polishes are THE BEST one to water marble with?? Or just Sally Hansen in general .. I'm never disappointed with the results I get when I water marble with them. I'm not sure if I would call them THE best, but some are really good! China Glaze spreads out the nicest I think, in general. Get professional and affordable mobile applications development services. We have expertise in developing a wide range of android and iOS mobile applications. Thanks you for very interesting this blog.